Good location close to A55 and within walking distance of Rhuddlan Castle and handy for Rhyl train station and football club. The town centre is just 2 miles away. This Premier inn hotel offers free on-site parking and has a Table Table restaurant serving quality meals throughout the day. 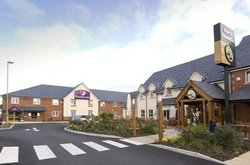 Book direct for the best Premier Inn Rhuddlan deals.